Holland & Barrett Quinoa is rated 4.6 out of 5 by 20. Rated 4 out of 5 by Griffiths 1 from Surprisingly very tasteful I haven’t regretted buying it is very tasty and flavourful. 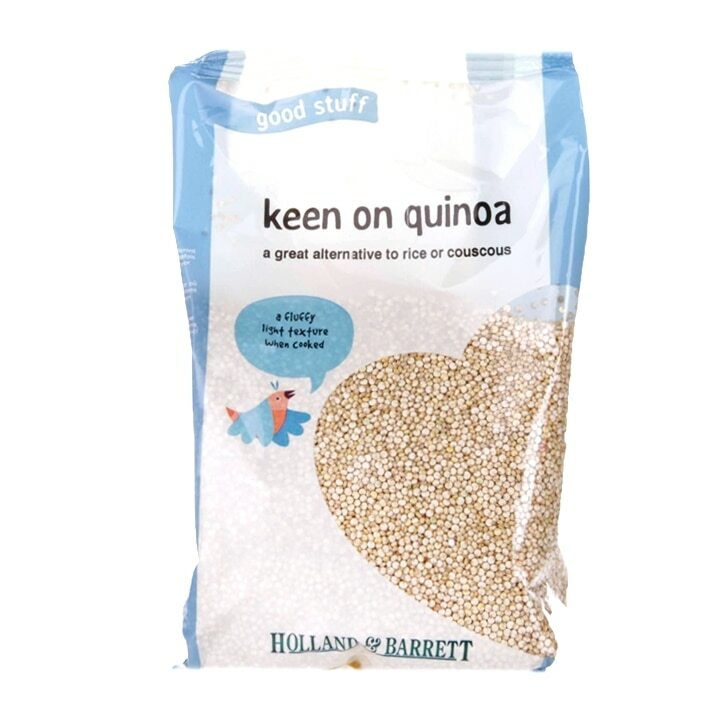 Rated 5 out of 5 by annacj from Tasty and Nutritious I love quinoa and when I saw this product I felt it was a great offer especially on the Buy 2 get 1 half price deal. The quinoa cooks quickly, has a soft texture and is super versatile. I often make Mexican dishes with it, but it's also a great addition to soups and stews or even as a simple side dish when served with a few herbs and vegetables. Highly recommended. Rated 5 out of 5 by Jammy1 from Qualityn Quinoa! This has been excellent. Have used to make porridge. Rated 5 out of 5 by Pecat from Love Quinoa I am a real quinoa lover!!! Have it absolutely every day!!! Rated 5 out of 5 by 14Maud from Nice grain I eqt Quinloa for breakfast daily with coconut milk. This one is easy to cook, has great taste and doesn't go soggy when cooked. Rated 4 out of 5 by Henrysgirl from Good stuff The quality of this quinoa is good, but there are no directions on the packet as to how much to serve per person, or how to cook it, or recipe suggestions. Rated 4 out of 5 by Ashford88 from very good quality Grains are larger and cook better than the brand we used to buy from our local supermarket. Very soothing and easy to digest.